Scapular retraction is the medical term for squeezing your shoulder blades together. The proper name for shoulder blades is scapulae (or scapula if referring to only one). And the actual motion of retraction is just that, retracting. Put together and you have scapular retraction. Many people don’t realize how important scapular retraction exercises are – they are actually one of the most important things you can focus on while working out. Put your hand over your opposite shoulder and on your upper back. Shrug your shoulders and you will feel your scapula rise. While standing up try to touch your two elbows together behind your back. This is the most basic way to start engaging scapular retraction. Once you have a better understanding of where your scapulae are and how they move you can better start targeting them with scapular retraction exercises. It is important to realize that the scapulae are not muscles, they are in fact bones. These bones, however, are covered with dozens of other muscles including the trapezius muscles and the latissimus muscles. These are the muscles you are trying to target during scapular retraction. These muscles are what move your shoulder blades up, down, left, right and retract & protract. At first, trying to focus on squeezing these muscles can be difficult. Your best bet is to partner up with someone. While doing your exercise have them apply pressure right between your shoulder blades. As you start with your movement try to concentrate on squeezing their hand at the pressure point as hard as you can. Eventually you won’t need the partner any longer and you’ll naturally start squeezing those shoulder blades together. This is around the same time you will most likely start seeing a difference in your standing and sitting posture. This is our favorite exercise for scapular retraction because of the deep stretch you can achieve with it. We also prefer to use free weights like dumbbells for scapular retraction exercises because they engage the body’s stabilizer muscles. Doing any of these exercises with a cable or on a machine will leave the body relying on that equipment more than its own muscles. 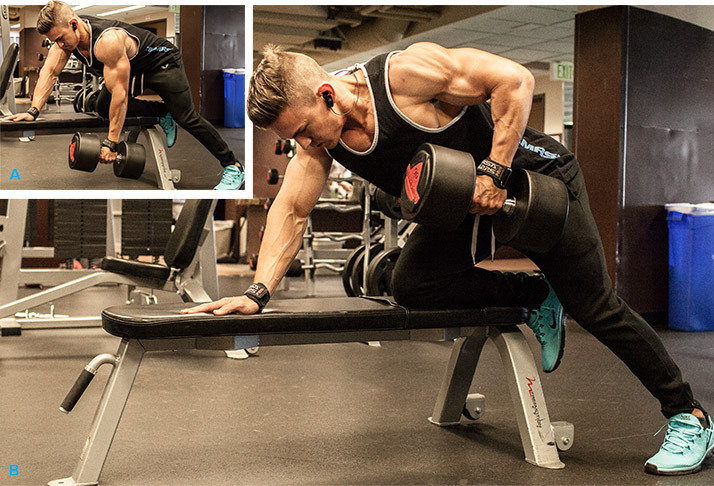 To complete this workout you should kneel one leg and place one hand on a bench. While bent over slowly lower your dumbbell to the floor, allowing your shoulder to fully extend. Then slowly and in a controlled manner pull the dumbbell back up to your shoulder. Be sure to keep your back straight during the entire movement and focus on moving the dumbbell with your elbow and not your biceps. Do not jerk the dumbbell around – stay in control of your body. Although we mentioned in the previous exercise that we prefer free weight exercises it always helps to throw in an occasional cable exercise. 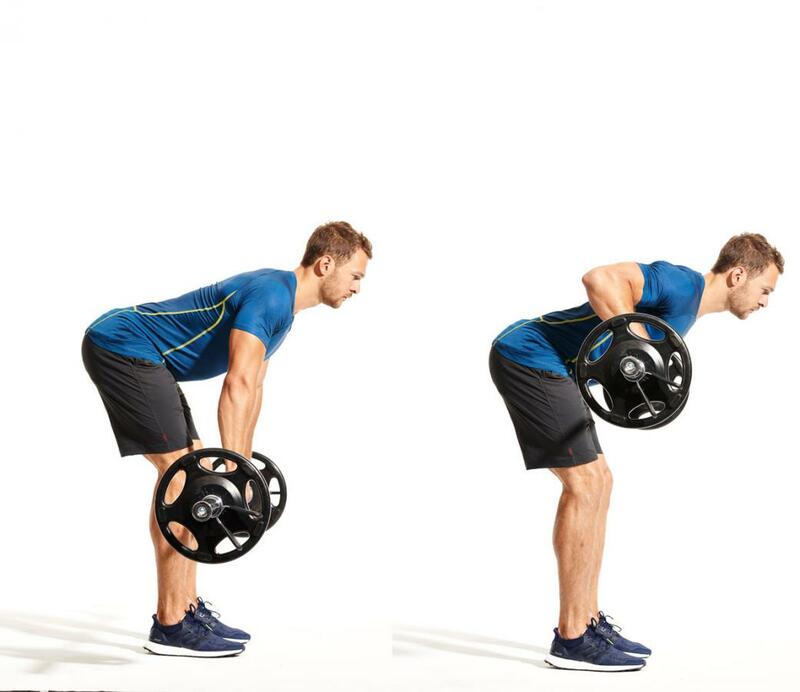 The seated cable row will engage your upper and middle back muscles. This is a great exercise to do when you first start focusing on scapular retraction. Slowly pull the cable in towards your upper chest until you just barely touch it. Be sure your chest is out as far as you can, your back is straight and you really feel the burn around your shoulder blades. When releasing the cable let it slowly return to the starting position – be sure to let the cable stretch out your back muscles as much as possible. Barbell rows are the best scapular retraction exercise if you’re looking to move serious weight. These rows will require a tremendous amount of effort for your trapezius and latissimus muscles – but in a good way! Be sure to keep your back flat and bend only at your hips – not from your waist. If you find yourself curling your back then you’re doing it wrong – go back to one of the first two exercises and focus more. When starting your row be sure to lift with your elbows and not your biceps. This should naturally force most of the work to your scapular region. You may be surprised to learn that ensuring proper scapular retraction is one of the most important things you can do in the gym. Having a proper understanding of the movements involved in moving your shoulders and how to do them will help make all of your back and shoulder exercises much more effective. Most of us could benefit from focusing on our posture a little more – especially those who work at a desk all day. We’ve all been told to stand up straight and tall, shoulders back and chest out. But actually standing and sitting like that all day every day can be difficult. By focusing on scapular retraction while working out you will be forcing your body to keep proper posture. Keeping your chest out will become much easier once you start forcing it during your exercises. After a few weeks of proper training you should be standing taller and prouder. Most people only think about their chest muscles when doing the bench press – huge mistake. The shoulders and the muscles surrounding your shoulder blades are just as important as your chest is. You absolutely must get in the habit of retracting your shoulder blades before you unload the bar. Trying to bench press without squeezing your shoulder blades together will make it twice as hard to lift the same amount of weight. You’re working out to make things easier – not harder. Retracting your scapulae will give you a firm and solid base to start and finish a great set of bench press reps.
Just like the bench press, squeezing your shoulders together will work wonders for your squats. The tremendous amount of weight on your shoulders needs a solid base for support. We are trying to work smarter – not harder here. Use as many muscles as you can in your body and your workouts will improve drastically. It isn’t uncommon for weightlifters to feel a slight tingle or twinge in their shoulders after moving heavy weights. This is a dangerous sign and should be a red flag to start taking it a little easier. This happens because so many people don’t focus on scapular retraction while working out. All of the muscles around your shoulder blades need to be conditioned regularly if you are planning on increasing the weights you are lifting. You can’t just focus on the ones that show most. By ensuring your scapulae are properly conditioned you are helping ensure you don’t injure yourself. Although this ties in with improving your posture, it is still important to mention that scapular retraction will help make your chest appear larger. A larger, stronger chest will help you command more attention and appear more confident. We could all use a little more confidence. Scapular retraction is one of the most important things you can do in the gym and if done properly should follow through into your everyday life. Even if you aren’t big into lifting weights the benefits of improved posture should be worth the extra effort. One day you’ll be thanking yourself for taking the time to focus on scapular retraction. And don’t forget – you can focus on retracting your scapulae all day any day – not just at the gym! One day soon you’ll find yourself readjusting your posture in your chair without even thinking about it.